Q: When I tried to log in to EEBA’s website, EEBA asked me for a cookie. How do I enable cookies? EEBA needs cookies to log you in. If you don’t have cookies enabled, EEBA will let you know. Here’s how to enable cookies on a few different browsers — Chrome, Firefox, Internet Explorer, and Safari. Click on any of the screenshots to enlarge them. You can enable cookies on an Android or iPhone / iPad too. If you’ve followed the instructions below but are still having problems, check the system time and date on your computer. An incorrect date may cause your cookies to not work correctly. If that’s the case, set your computer to update it’s time from the web automatically, then delete any cookies from EEBA you may already have. That will let you log in properly. In Chrome, type “chrome://chrome/settings/content” in the url bar and press enter. That will take you to a page where you can edit how cookies are saved in your browser. 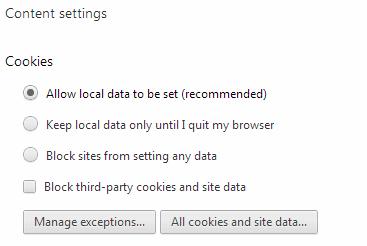 Choose “Allow local data to be set” in the Cookies area. In Firefox, open the Privacy tab of Options. Cookies are enabled if you select “Remember history” or “Never remember history.” If you select “Use custom settings for history,” make sure that “Accept cookies from sites” is enabled. 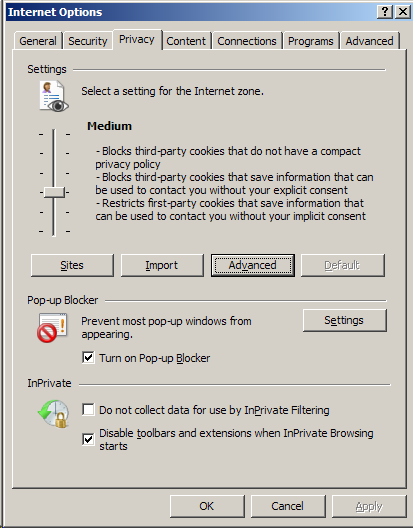 In Internet Explorer, open the Privacy tab of Internet Options. There, check the privacy level you have chosen. Privacy levels “High” and above don’t accept cookies. Also, be aware that “Private Browsing” mode may block cookies as well. You may need to uncheck “Private Browsing” in the Safari menu and restart your browser. On Android, launch your browser, press the Menu button, then tap More, then Settings. Make sure “Accept cookies” is checked, which may require scrolling down. Once cookies are enabled on your browser, you should be able to log in to EEBA.